A librarian once told me her favorite book was usually the one she’d just read. Bone Gap by Laura Ruby fits that sentiment for me. Have you ever reached the end of a book and all you want is for everyone you know to read it? That’s how I feel about this book. I feel like recommending the crap out of it. I also felt an immediate compulsion to contact the writer and drool all over her. It’s easy these days –. look up the author’s website, go there and send an email. So I did. I don’t think any writer every gets tired of hearing how her story affected a reader. The last time I wrote a fan letter to an author I was twelve and the author was Albert Payson Terhune, who wrote the Lad a Dog books. I received a return letter from Mr. Terhune’s son. His dad had passed away some years before. I hadn’t written a fan letter since. 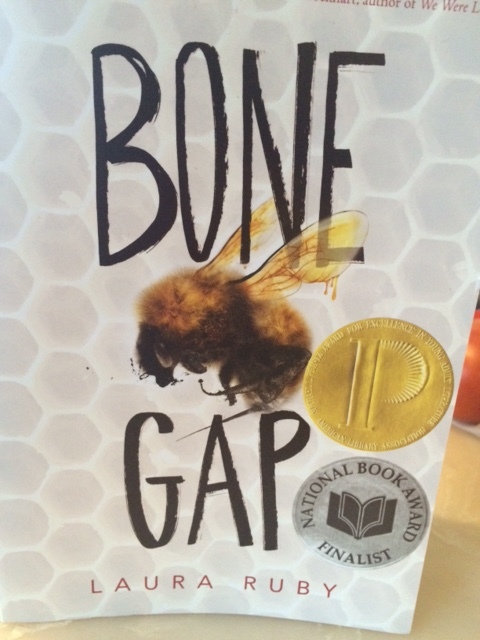 Bone Gap is the story of two brothers, the girls they love, and the town they live in, Bone Gap. It begins with the kidnapping of one of these girls. And that’s all I feel I can tell without spoiler alerts. I will say it’s a great example of magical realism, has some gorgeous language, and with characters that jump off the page. I’ve been in a bit of a writing malaise. When I’m in this state, I don’t know if it’s a good thing or bad that I read a book like this. To be able to write a book with so many levels, that touches a person so deeply, must be awesome. I don’t know if I will ever write anything remotely resembling Laura Ruby’s Bone Gap. On the other hand, the book makes me want to try harder to achieve something close to it. My malaise may be lifting. Thank you, Laura Ruby, for this wonderful story. Thank you for the inspiration and challenge. You’ve made me want to try again. Glad to hear you’re inspired. Great way to start the summer. Thanks for the recommendation. I’ll put it on Kindle. I’m in the same writing malaise. If I don’t have a deadline or a gun pointed at my head, I’ll sit around drooling on myself, whilst thinking about writer or other writers. Ugh!!! That would be: thinking about writing. Sheesh. I will put it on my list. Great Blog Brix! !